The Mayor of Medlar-with-Wesham and Town Councillors were amongst the many invited guests to the official opening of the new Scout Centre on Friday 24th October. The Scout Centre, built with the help from many local businesses, was formally opened by Michael Jack M.P, ably assisted by Master Sam Clegg (Cub Scout). John Barnes's dream came to reality after many years of planning. John, who layed the foundation stone was given an emotional standing ovation when he received a certificate in recognition of his efforts. John, a life long Scouter has been actively involved with the First Kirkham and Wesham Scout Group for over 30 years also received recognition for his exemplary service to the Scouting movement. An excellent audio presentation was given by Mr Geoff Sumner who had recorded the entire process from demolition of the old 'Scout Hut' to the fine purpose built 'Scout Centre' . Further work is anticipated to complete the building once the final funding can be achieved. The Scout Group are currently raising the remaining £14,000 necessary and would value and appreciate any contributions towards their goal. Arranged by Cllr Linda Nulty, Wesham Town Councillors recently held an informal meeting to discuss a potential planning application for housing on the land at the rear of the Fleetwood Road recreation ground, (yet to be submitted to Fylde Borough Council.) It was agreed that at the next Medlar-with-Wesham Town Council meeting (held on 21st October) it would be proposed that a 'Public Meeting' would be arranged to give residents an opportunity to be made aware of the potential proposals and to listen to their views. At last nights Town Council meeting (21st October) Cllr Nulty proposed that the meeting would be held at Wesham Community Centre on THURSDAY 27th November, at 7.30pm. All Councillors agreed. Further details will be circulated in a leaflet to be delivered to every household. 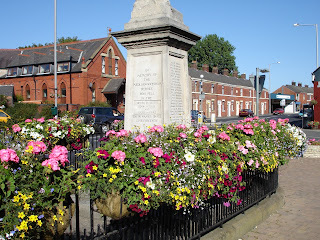 Wesham receives an award in the 2008 North West In Bloom Competition! The Chairman and Secretary of Wesham Community Pride Trust, Alan Clayton and John Westmoreland, were delighted to accept the award at the prestigious North West In Bloom civic pride event held at the Liverpool Echo Arena on Tuesday 7th October. They were presented with the award of Best Small Town Joint Second Runner Up by the Lord Lieutenant for Merseyside, Dame Lorna Muirhead and the Mayor of Trafford in front of 500 invited guests. In making the award the judges took into consideration not just our magnificent floral displays, but also the efforts made to encourage community involvement and pride in our local environment. They were particularly impressed with the facilities for children and dog walkers at Doorstep Green, and also the high standard of gardens throughout Mowbreck Park. The judges also took into account the contributions of Operation Cleansweep and the Best Kept Gardens Competition to the appearance of the town. The award is also a well-deserved recognition of the high standard of work by the Fylde Borough Council Parks Team in planting and maintaining our floral displays throughout the year. Wesham Community Pride Trust would like to thank everyone who has played their part in improving our town and achieving this award! 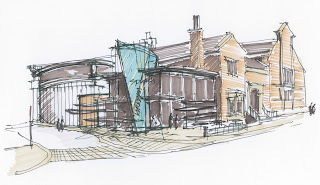 "CALLING ALL SUPPORTERS OF KIRKHAM BATHS"
If you are supportive of keeping the baths open go along to hear from the Rural Splash Team what progress has been made and what the future holds.